extreme topography with steep uphill and downhill trails and sheer cliffs. Token, the engine captain on a Jemez Ranger District engine has been missing for four days. The last communication from Token was received on Friday afternoon from Holiday Mesa. He and other firefighters from the Ranger District were responding to a smoke report and searching for the 25-acre School House Fire located near School House Mesa. incident, search efforts have not been successful. Personnel are using GPS as part of this grid pattern and are being asked to report their locations hourly. Searchers will focus today on determining that certain areas have been fully searched. once again affect both air and ground operations. efforts as part of a unified command along with multiple Federal, State, County and local agencies, on Wednesday morning at 6:00 a.m. The family continues to ask that their privacy be respected during this difficult time. 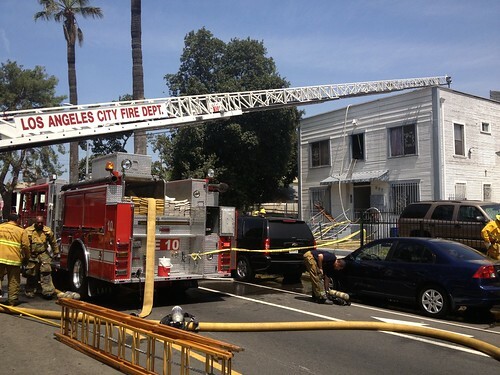 LOS ANGELES – On August 1, 2013, LAFD Firefighters battled a preventable fire in a two-story apartment building that injured a 16 year-old girl. Just after 11:00 A.M. firefighters were summoned to a Structure Fire on the 900 block of E Adams Boulevard, where they found fire blowing out of one unit on the second floor of a two-story Center Hallway Apartment. Additional firefighters were immediately requested. Due to an aggressive attack firefighters were able to quickly get water on the flames before they consumed the building. Approximately 35 firefighters, all under the command of Battalion Chief Surgey Tomlinson, extinguished the fire in just 17 minutes. The flames were confined to one-unit that was well involved in fire on second floor. One patient, a 16 year-old girl, suffered smoke inhalation and was transported to a local hospital for evaluation. 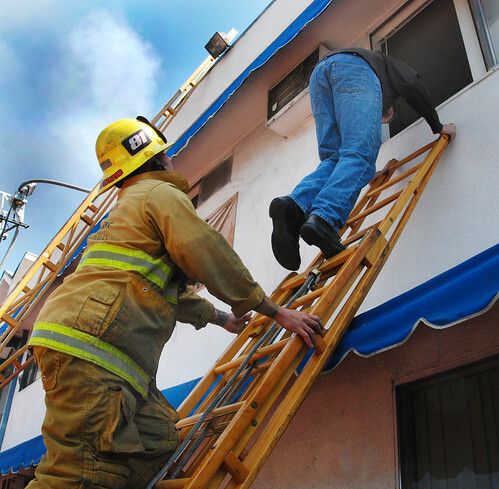 LAFD Arson Investigators determined the cause of the fire was a candle accidentally falling from a window ledge and landing on the bed. The occupants attempted to extinguish the fire with water, and thought they had, however the embers continued smoldering and reignited. 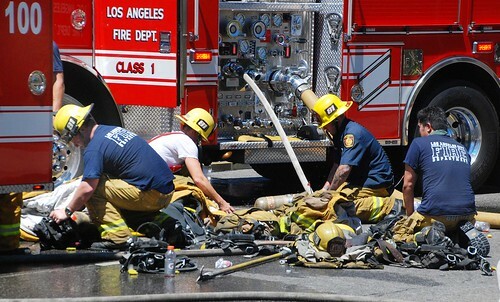 Your Los Angeles Firefighters offer two teachable lessons from this fire. – On average, 42 home candle fires are reported every day. – More than half of all candle fires start when something that could burn, such as furniture, mattresses – or bedding, curtains, or decorations is too close to the candle. – Over one-third (36%) of home candle fires begin in the bedroom. – One-half of home candle fire deaths occur between Midnight and 6 am. – Young children and older adults have the highest death risk from candle fires. – If you do use candles, ensure they are in sturdy metal, glass or ceramic holders and placed where they cannot be easily knocked down. – Avoid using candles in bedrooms and sleeping areas. – Keep candles at least 12 inches from anything that can burn. – And NEVER leave burning candles unattended! Second: If you have a fire at home call 9-1-1 immediately to summon the local Fire Department who will ensure it is properly extinguished. THE END OF THIS STORY CONTAINS SOME GOOD FIRE PREVENTION TIPS WE SHOULD ALL BE REMINDED OF. THANKS TO THE HOUSTON FIRE DEPARTMENT FOR SHARING THIS EXAMPLE OF WHY SUCH STEPS ARE SO IMPORTANT. WHEN: The Houston Fire Department was dispatched to the fire just after 12:30 a.m. this morning, June 10, 2013. INJURIES: One resident was transported to the hospital and was reported to be in stable condition. 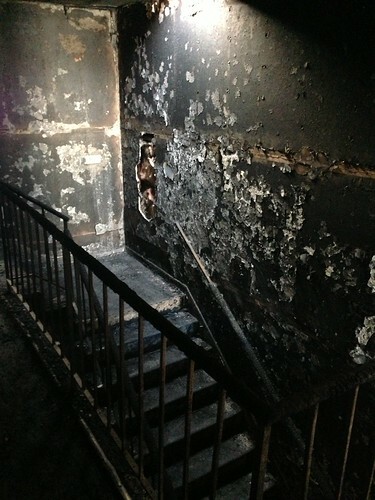 DAMAGE: The apartment suffered from about $4 thousand in estimated damage. CAUSE: The cause of the fire was determined to be a cooking fire in the kitchen. DETAILS: Firefighters arrived on scene to find smoke coming from the 3-story apartment building with a report of a possible person trapped. The crew of Engine 37 and Ladder 33 located a victim in a wheelchair and helped to remove her from the apartment. She was treated on scene and transported to the hospital. Crews extinguished a small fire in the kitchen area and tapped out the fire just before 1:30 a.m. Approximately 60 firefighters responded to the incident. • If you attempt to extinguish the fire, it is best to use a class ABC multipurpose fire extinguisher. 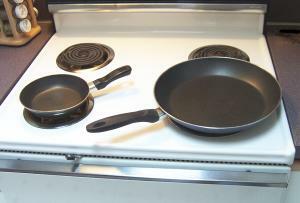 Follow the manufacturer’s instructions – stay back 6 to 8 feet and be careful not to spray the grease out of the pan. Baking soda can also smother the fire. Fires can double in size every 30 seconds.